There are two things I learned about clean eating the last time I tried it: it works, and it’s expensive. It’s also time consuming, but I knew that going in. Not so much a learned thing. How do you people do this and make ends meet? I need some suggestions from folks on a budget who are making this a lifestyle. It’s the ‘because it works’ part that I’m going back in. I’m tired of being overweight and unhealthy and I’m tired of my teenage girls feeling the same way. Time for a reboot. Beginning again isn’t going to be easy. I remember how hard it was to give up all the things that made this south Louisiana girl’s heart and tummy happy. My challenge will be finding ways to make those things clean. This could be tough. Baking is the other tough one. Not so much that I love to bake. I actually don’t like it at all. What I like are baked goods that someone else made. And raw cookie dough. Baking seems to be where the major expense comes in as far as clean eating goes (other than meats). I mean, I can grill some veggies pretty cheap, but if I want a clean baked thing, there’s all sorts of odd and expensive flours and sugars that you need. Let’s face it, coconut sugar and almond flour aren’t cheap like white sugar and white flour are. I know why that’s true, but it doesn’t make the fact or the cookies any easier to swallow. We are the family that processed foods were made for and clean eating laughs in the face of. We are broke and busy. Why is it that I can buy frozen pizzas for a little over a dollar each, but to cook a healthy clean meal for 4 people it may as well be a restaurant sit down dinner someone else does the work and dishes for? Why is that the way of the American grocery industry? Sure, I could grow my own food, and I do to some extent, but it’s going to be a long time before this container garden is adding anything to our meals. Don’t misunderstand this to be a rant against clean healthy eating. It’s not that at all. My reboot, and the numbers on my scale, have just brought glaringly to mind the problems with clean eating that shouldn’t exist, because they are really problems with the American processed food industry and the other parts of feeding the American people that make healthy food out of the budget of the majority of Americans. That’s so wrong. It makes me wonder what countries in Europe are doing that we aren’t, and how we follow their example. They don’t have the land and resources we do, and yet, they eat much better than us. Processed food is rare. I remember coming back from trips abroad and wanting to keep eating the way I did in Europe. But somewhere along the way, I slipped back into the rhythm of convenience with processed food. I felt worse, but less broke. So, another suggestion I need is quick and easy weeknight meals that don’t require spending a weekend doing meal prepping when there are ballgames and rehearsals that must be done. And variety. That would be good. There are tons of variations on cilantro lime chicken. I got that one down. Cheap and quick clean meal suggestions. On your mark, get set, GO! 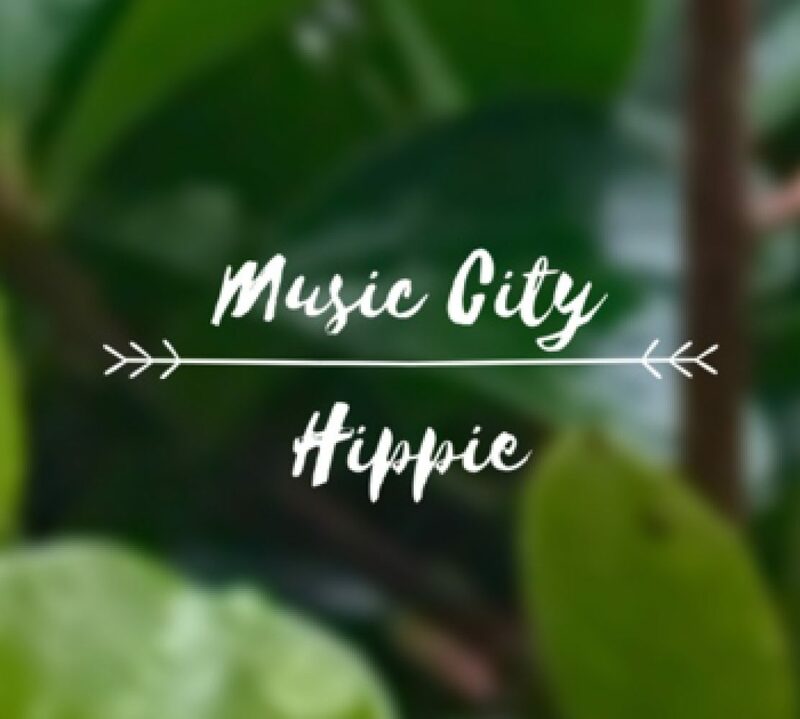 Help a hippie out, please! Nutritionists will tell you to “eat a rainbow.” There is a very good reason for that when it comes to the fuel your body needs. Much of the American diet is a shade of brown. If shades of brown are the main palate of your plate, consider making a change for the vibrant. Fried foods, breads, gravies, pastas. All of these things are delicious or they wouldn’t have taken the country by a storm over recent decades. However, they lack nutrients and the energy boosting vitamins we need. They leave us feeling bloated, tired, and with cravings we seek to satisfy. Cravings are often our body’s way of communicating needs. How we interpret the signals determines what we eat or do to satisfy the need. Heading off a craving will always be a better choice than struggling to interpret our body’s craving. Consider a popular meal from an initialed restaurant chain: fried chicken, mashed potatoes and gravy, and Mac and cheese. Once could argue that there are some nutrients and protein on that plate, and even a few colors: brown, white, yellow. If you put that monochromatic plate next to the one in the photo above, which one is the better choice? Simple, right? Sure, it is. The problem comes from a mentality of convenience. A drive through is a time saver in the short run, but can cost you dearly in the long run. Once in a while, we have little choice. Life happens. Our culture has evolved into something that sees convenience as the ultimate goal. This is sad. We have over scheduled ourselves to the point where we don’t make time for preparing and sharing a meal with our family and friends. There was a point in history where meals where almost ceremonial in nature. Generation after generation, the change from being present to rushing towards the future has avalanched. We over schedule ourselves and our children. Think past this a bit and imagine what our grandchildren will be doing. As a teacher, I actually have parents telling me their child didn’t have time to do their homework because they got back from dance lessons too late. Priorities have shifted dangerously. What effect will this have in the next generation? If we don’t slow down and make some positive changes, we are dooming ourselves and future family members to lives of unhealthy perceptions of what is a good life. Make time for a colorful meal. Make it important again. Make it ceremonial again. Make what you eat a conscious choice. A vibrant one. Eat with the seasons. I’m not saying these things will cause the overall ride to turn, but taking steps to instill in ourselves and those around us that we are worth taking time for can never be a bad thing. When we take the best care of ourselves, we have less weighing us down physically and spiritually which allows us to give more to build up those around us. Taste the rainbow, just not the candy-coated one. Please like, share, comment, and follow! Let me just start by saying that I haven’t done yoga in ages. A friend of mine threw down the gauntlet to a 30 day yoga challenge to get me back into it, so here I am after years of not doing it. Don’t get me wrong, I love yoga and used to do it regularly. Then, with kids and a busy schedule, never made the time for it. Big mistake. 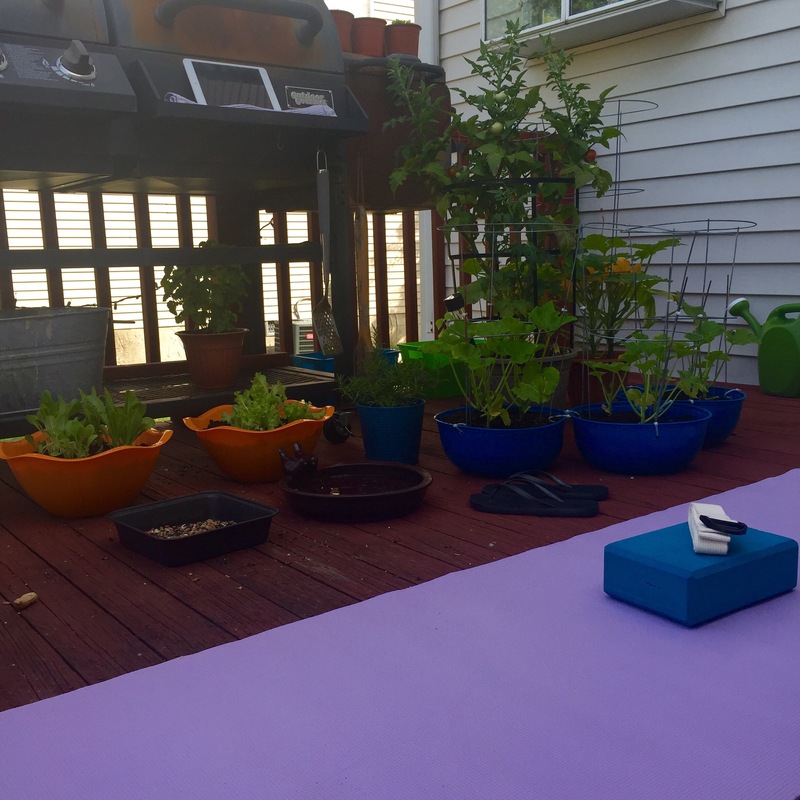 So, to take back my practice and the time to do a little self-love, I brought my yoga outside to my deck sanctuary. It’s the place that makes me happy, so it seemed like the natural spot to renew my yoga practice. The container garden plants are growing, and so am I. Notice the iPad mini propped up on the smoker side of the grill. The same friend who challenged me introduced me to Yoga With Adrienne on YouTube. It’s free and Adrienne is encouraging and laid back- perfect for any level, but especially unintimidating for those new to the practice. Go check out her channel and give it a try. It was nice to be outside with the breeze and the birds, but it was definitely warmer than indoors. It gives new meaning to the term “hot yoga.” Of course, this meant ending my session with something cold and fruity. Peach water today. 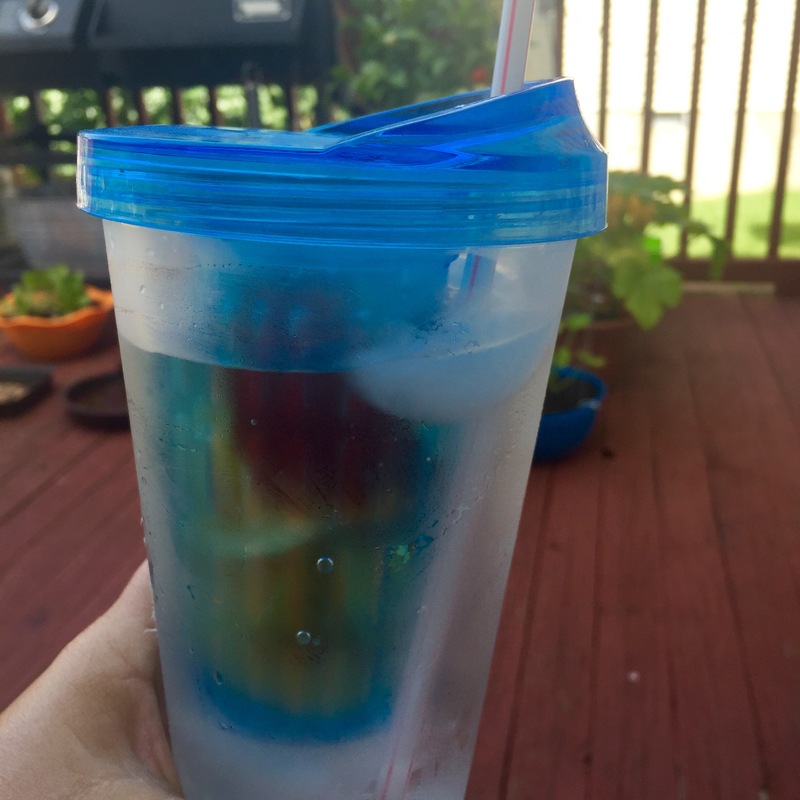 If you don’t have one, I highly suggest an infuser cup. Do something good for yourself today. Something uplifting for your body, mind, and spirit. Then, share your experience in the comments to inspire others. As you know, my back deck is my outdoor sanctuary, even in the middle of the day if I can stand the heat. It stays shaded by the house for a lot of the day, which makes it the perfect spot for lunch. This is one of my favorite clean lunch menu ideas. 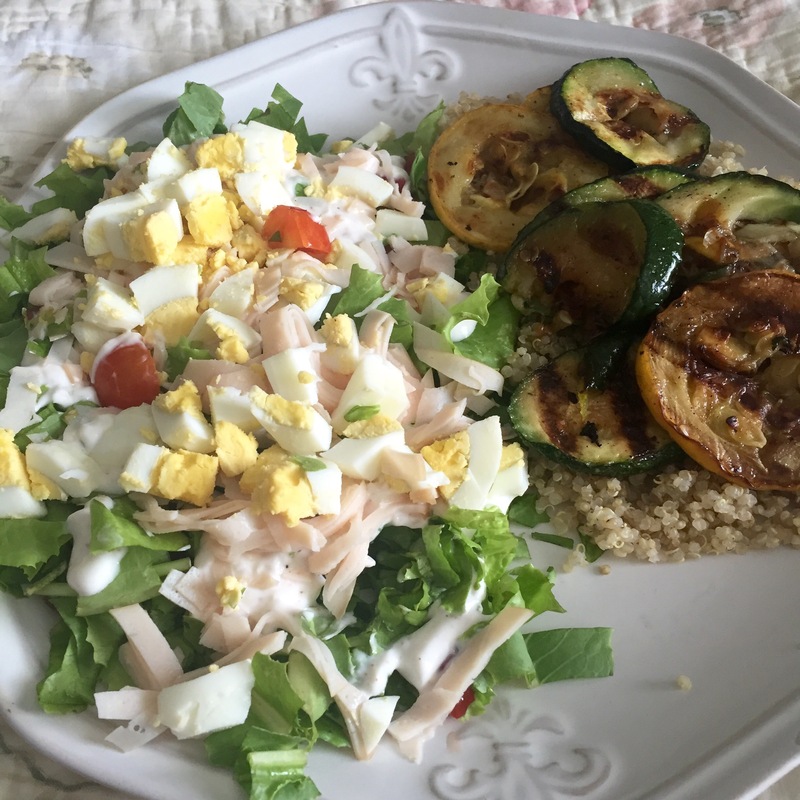 Grilled summer squash and zucchini over quinoa, strawberry spinach salad, and fresh fruit. Of course, a refreshing glass of ice water with lemon is perfect all the time. For the grilled vegetables, I seasoned them with salt, pepper, garlic, and a pinch of cayenne, then tossed them in olive oil. Then, on my counter top grill made by the boxer guy who gave all his kids the same name, I cooked the veggies while the quinoa was bubbling away. You could also do them on an outdoor grill, but I suggest long thicker slices that are easier to manipulate and keep from falling through the grill grates. Quinoa is my new favorite thing! So versatile and easy. If you want to add a little savory-ness to this dish, sub out the water for chicken stock. The strawberry spinach salad is so refreshing and perfect for summer, but, to be honest, I eat it year round. I tear up some baby spinach leaves, then top it with chopped strawberries, raw walnuts, feta cheese, and some raspberry vinaigrette. Seriously, I could eat this for lunch every day. It’s actually a great dinner with the addition of some grilled meat of your choice. A deliciously simple clean meal menu. I will keep sharing clean menu ideas that I make, and would love for you to share some of yours! (Yeah, the leftover boxes weren’t as clean as the rest but did contain a salad and quinoa. And the condiments hadn’t been extricated from the door yet. Also, I decided I didn’t like the Chobani Greek yogurt , but am IN LOVE with Fage 2%.) Won’t take long and she will understand how much better real real food is.